Michelle Obama is not just a leader in heels. She is an inspiring, influential figure proving that women are no longer sitting quietly behind their husbands in power but working beside them. Mrs O is a highly educated, intelligent and passionate working mother of two continually inspiring women all over the world to speak up in order to be heard. She is a valuable voice of our generation, her work, dedication and pure passions have represented the solidification of women’s role not only in politics but wider society. 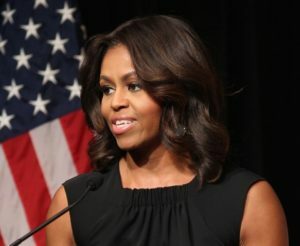 She helped raise over $3.5 billion in one year for ‘Let Girls Learn’ a global initiative aiming to get 62 million girls into school Michelle Obama is passionate about values of friendship and health. Her views towards exercise are not dissimilar to ours “I began to prioritize exercise because I realized that my happiness is tied to how I feel about myself. I want my girls to see a mother who takes care of herself’ making her a genuine role model. At the age of 65, like many women of her generation, despite having enjoyed a successful career as a management consultant and raising a family, she felt she had more to give. 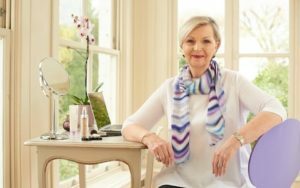 Tricia, now 70, founded Look Fabulous Forever in 2013 having become frustrated by the lack of products available specifically for more mature skin. As she was using products from several different brands to achieve the look she wanted, she was inspired to create a range of makeup which provides a one-stop shop for older women. Tricia also wanted to create a place of celebration for older faces by only using real women over 50 in her photographs and video. Her YouTube channel features nearly 100 videos which demonstrate how makeup can address specific issues women experience as they grow older. These have now had nearly 5m views! Ten years ago Katie was brutally attached. Understandably, she was overwhelmed by feelings of anger, pain, and bitterness about an attack that disfigured her and affected her both physically and mentally. It is her sheer determination to only look forward that has completely inspired me and women across the globe. A TV career, an author, happily married and a mother, Katie Piper has not let the tragedy of these events define her and has instead proved that the strength of a woman can carry the weight of the world! Helen Mirren has ripped up the fashion rule book and become one of the most influential, inspirational, phenomenally successful actresses of our time – not to mention one of the most stylish! I am inspired by Helen’s attitude to trample on stereotypes and her attitude towards positive ageing – loving yourself and your body. Helen’s gorgeous physique is one that women of all ages could envy and it’s not achieved through hours in the gym but what she says is purely a 12 minute home workout that can be achieved anywhere, anytime!